The following commands generate random numbers for x and y between 0 and 1 and then plots a point at the location of the coordinate pair. plot( x, y, type="p", pch=". 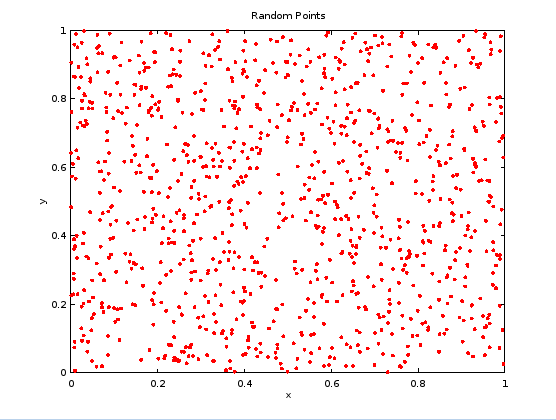 ", col="red", main="Random Points") # Plot type is "p" point using the character "." 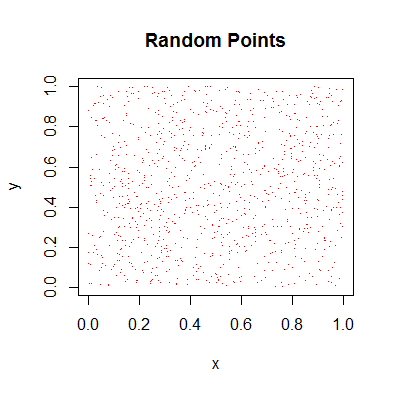 x = unifrnd(0, 1, n, 1) # Generate a random number with uniform distribution between 0 and 1. The last two parameters give the number of rows and columns. A product of cosine and sine functions is plotted bewteen 0 and 5 on both the x and y axis. 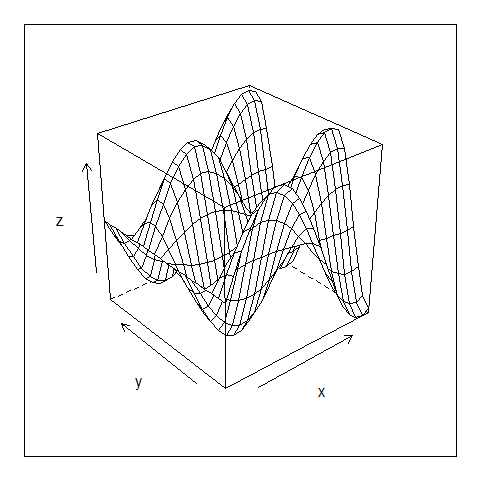 The three plots formed are a level plot, wireframe and surface plot. The level plot would look much better if a larger gird of points were used. 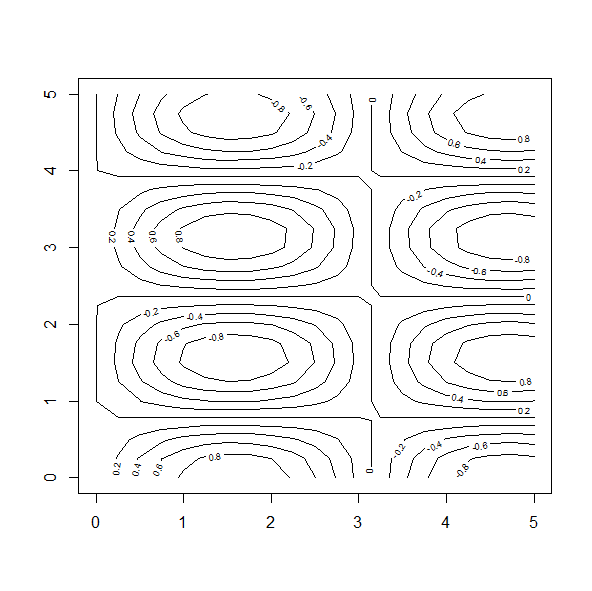 There are additional packages for R that allows for smoothing, which would improve the quality of the level plot. 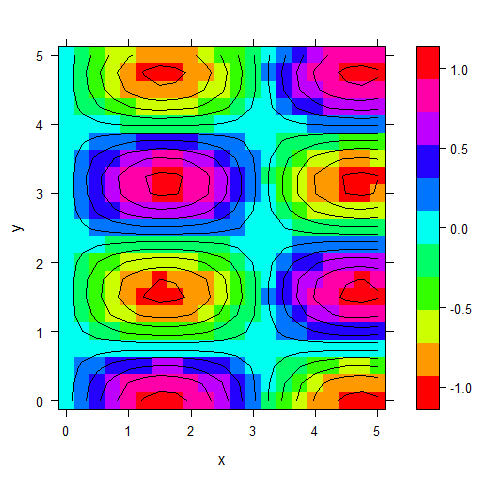 If the data is placed in a different structure, then the filled.contour function can be used instead of levelplot. 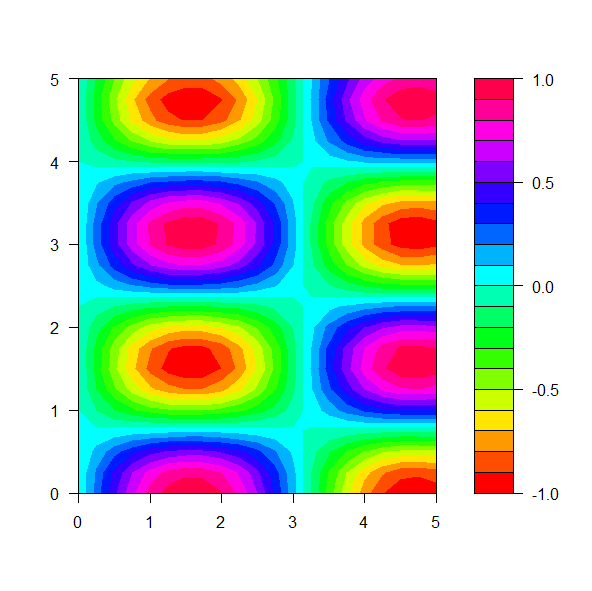 This code generates the following plot. 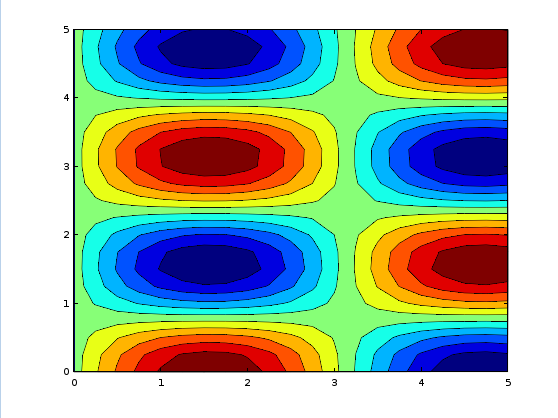 If the contour function is called it generates the second plot with no filling. The following are a contour, wireframe and surface plot. 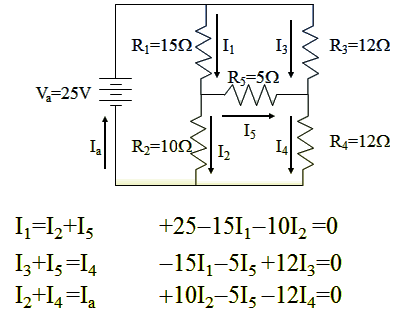 This network of resistors requires the use of Kirchoff's Law. The equations for this network are given above. To solve these equations the six variables must be expressed in order as a series of rows in a matrix. The constant voltages are placed on the right side of the equation and must be expressed as a vector. Finally the matrix and vector can be used to determine the solution. Notice that when entering coefficients for the different currents, that missing currents in the equation imply their coefficients are zero. You get the same result with fewer significant digits. 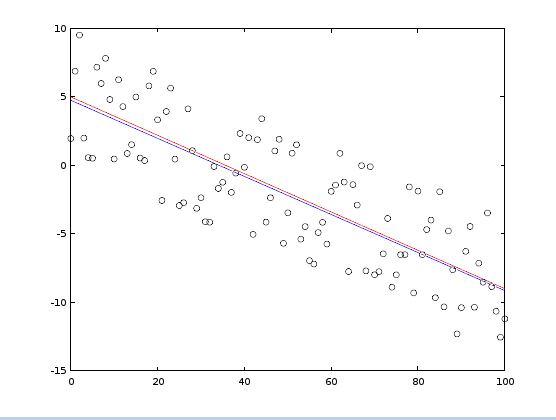 To demonstrate how linear regression is done a series points are generated. 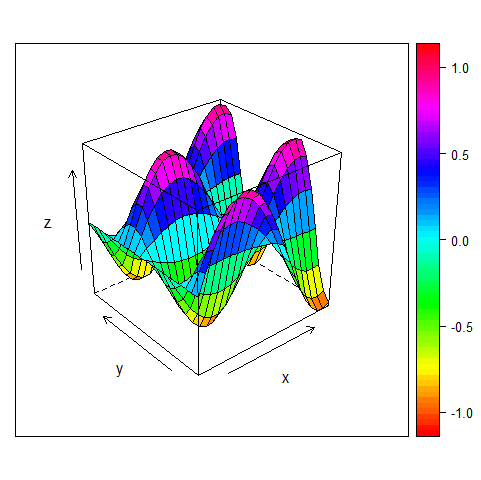 The x values range from 0 to 100 and the y values fit an equation of y = 5 - 0.14x with superimposed noise. Running the script results in the following statistics being displayed. In addition the following plot was generated. The red line is the original line before the noise is added. The blue line is the best fit of the noisy data. Notice the Estimate of the y-intercept is 5.14 with a standard deviation of 0.56. The estimate of the slope is -0.135 with a standard deviation of 0.0097. 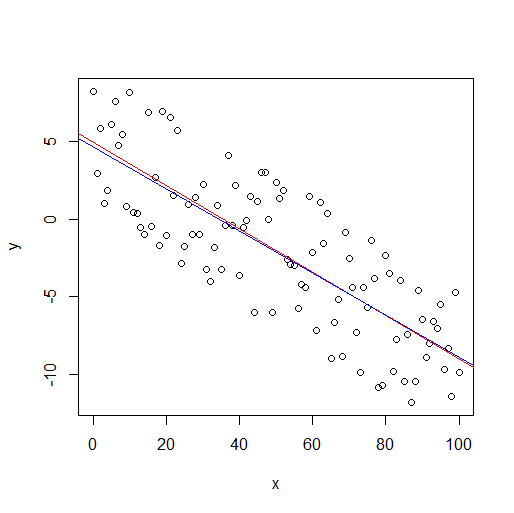 The R-squared value is 0.66 because the data is so noisy. Running the script results in the following statistics. To display them type p and p_var to show the values of the fitting parameters. In addition the following plot was generated. The red line is the original line before the noise is added. The blue line is the best fit of the noisy data. Notice the Estimate of the y-intercept is 4.76 with a standard deviation of 0.35. The estimate of the slope is -0.13901 with a standard deviation of 0.0001. This deviation is not large enough to include the value of the actual slope. 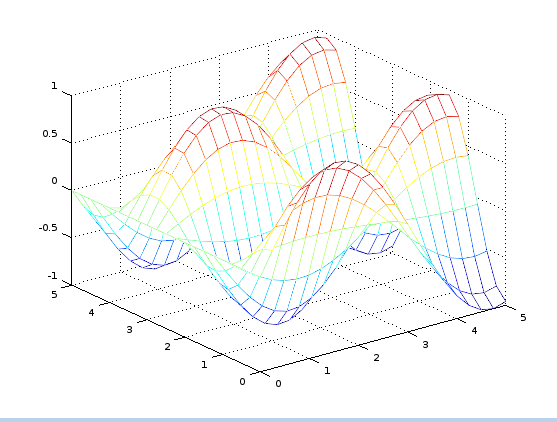 Solving ordinary differential equations with these programs is done numerically. Using initial conditions for spatial coordinate and its higher time derivatives, progression of the coordinate is calculated with small increments in time. 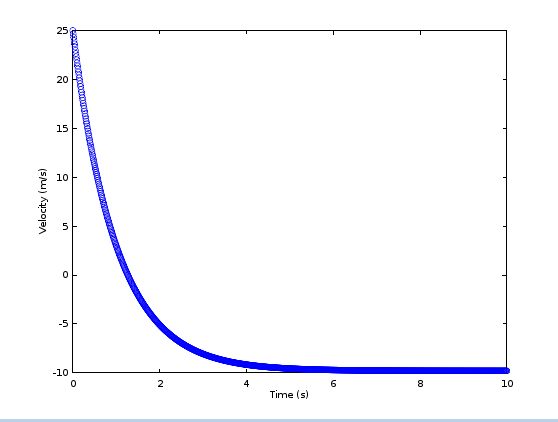 For more accuracy the time increments are made smaller, thus increasing the computational time for the solution. The solution is a series of numbers which can be plotted against time. 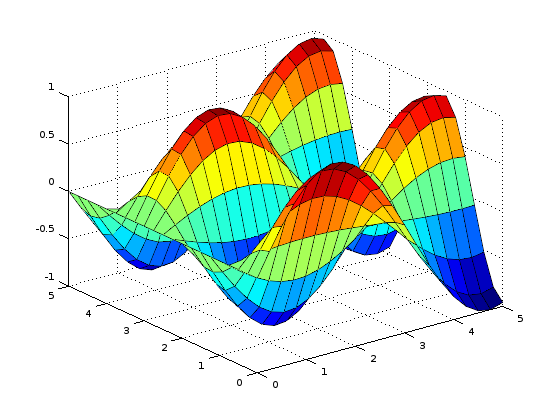 A functional representation of the solution is not possible with numerical solvers, but some classes of problems have analytic solutions which can be found using algebraic solvers such as Mathematica, Maple and Maxima. 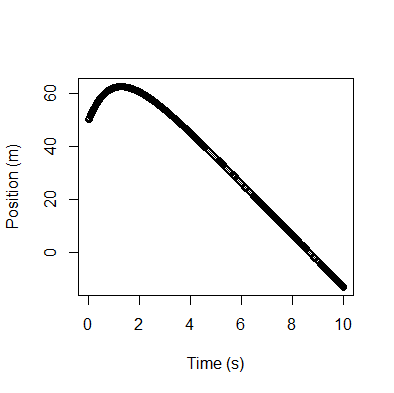 The first plot shows how the projectile reaches some maximum height and then begins to descend. 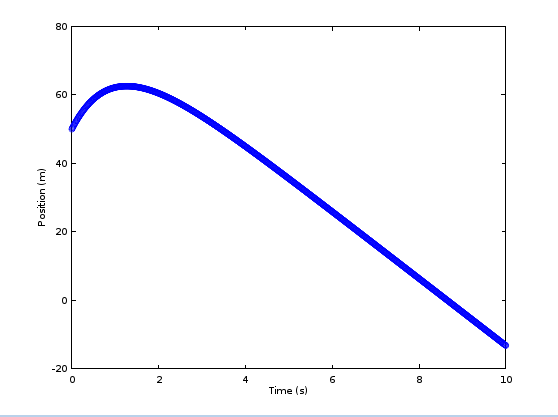 The second demonstrates a decreasing velocity which eventually becomes negative. 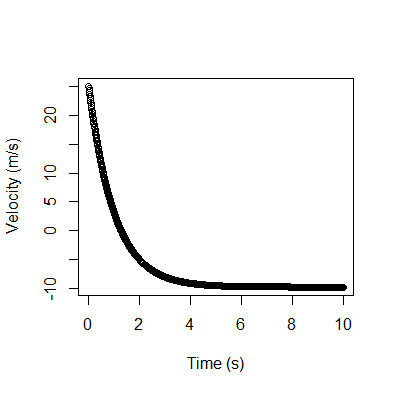 The velocity flattens out at the end because the projectile has reached terminal velocity.